A LOVE affair will always have its ups and downs – and the relationship between managers and their clubs is no different. The quickie divorce which ended Eastbourne Borough’s 13 years of wedded bliss with Garry Wilson and Nick Greenwood came through this week, but both parties are likely to remember each other fondly for years to come. The love story began in 1997 when Greenwood joined the Langney Sports coaching staff, under manager Steve Richardson. When the latter walked out in January 1999, the Lancastrian briefly took temporary charge before Wilson was handed the reins. Together, the pair, besotted with the club’s potential, began the process of transforming Sports into a side capable of climbing the pyramid. It wasn’t quite love at first sight – a home defeat to Redhill in the pair’s first game in charge was an inauspicious start. But patience is the key to any lasting relationship and Wilson and Greenwood quietly assembled an experienced squad which bludgeoned the County League into submission. Sports lost just one league match on the way to clinching the title and with it promotion to the Southern League – and the lust for more success began. Life in the Dr Martens Eastern Division began with two creditable mid-table finishes before the newly-renamed Eastbourne Borough mounted another promotion push in 2002-03. Wilson and Greenwood’s side, spearheaded by the goals of Scott Ramsay, outlasted Salisbury, Stamford and Bashley to clinch second and a place in the Dr. Martens Premier. A further promotion, of sorts, came the next season when a top 13 finish ensured founder membership of the newly-formed Conference South. A poor start to the next season had the doubters crowing but Wilson picked up two manager of the month awards as he and Greenwood masterminded an unlikely late assault on the play-offs, aided by the goals of ex-Eastbourne Town hotshot Yemi Odubade. Wins over Thurrock and Cambridge City fired Boro’ into the biggest game of their lives, a promotion final against Altrincham at Stoke’s Britannia Stadium – however, stage-struck Sports froze and Alty won 2-1. The brush with the big time appeared fleeting as Boro’ had to dig deep the next season to avoid relegation, but they also finally reached the FA Cup first round – a twice-taken Ollie Rowland spot-kick, captured by the Match of the Day cameras, earned a replay against League Two Oxford. Wilson and Greenwood reshaped the squad for the 2006-07 season, bringing in Paul Armstrong, Neil Jenkins, Allan Tait, Pat Harding and Jay Lovett. The changes brought the desired effect, although they narrowly missed out on the play-offs – however, this proved a mere warm-up for the superb 2007-08 campaign, the most successful of the pair’s years in charge. Boro’ embarked on a 20-match unbeaten run until a New Year’s Day defeat to Lewes, as the two Sussex thoroughbreds galloped towards the finishing line neck and neck. The Rooks snatched the title but Boro’ rallied for one final push and, in a memorable play-off final at Stevenage, late strikes from Nathan Crabb and Paul Armstrong gave Wilson and Greenwood the finest hour of their careers. The enormity of their achievement was underlined when a fixture list which once involved trips to Saltdean and Sidley instead brought visits to Torquay, Mansfield and Wrexham. But, bar a brief goal drought solved by the loan signings of Plymouth duo Ashley Barnes and Dan Smith, the club coped admirably and finished mid-table, an incredible feat given their resources and part-time status. The highlights included a late winner over Stevenage in the first-ever live televised Boro’ game at Priory Lane and a 4-2 despatching of Torquay. The next two seasons proved more troublesome, however. Cracks in the relationship began to show as, in both campaigns, a promising start gave way to winters of discontent and long stretches without a victory. They did enough in the 2009-10 season to set up a final-day decider against Oxford but still needed an 82nd minute penalty, coolly converted by Simon Weatherstone, to preserve their Blue Square Bet Premier status. They were not as fortunate the third time around. Another mid-season slump proved too much for a part-time side stretched by crippling injuries and relegation came almost as a relief after a tough campaign. There were high points – a remarkable Matt Smart free-kick from inside his own half and Darren Baker’s 900th appearance – but they were few and far between. 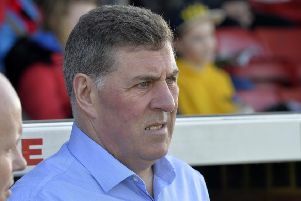 Wilson even handed in his notice after a 4-1 home defeat by Tamworth –it was turned down by chairman Len Smith, but was a portent of things to come. The split came suddenly – but when Wilson, Greenwood and Smith come to look back through the photo albums as just good friends, they will reflect with some satisfaction on 13 unforgettable years together.